These two Creve Coeur residents weren’t afraid to break from the ubiquitous Scandinavian color trend — and the finished look is so refreshing it’ll have even the most steadfast homeowner reconsidering bold interiors. Designer Stacy Hillman’s motto is straightforward: “The more color you use, the easier it is to decorate,” she says. When her clients were ready to put the finishing touches on the 4,689-square-foot villa built in 2015 by Benton Homebuilders, Hillman incorporated Moroccan and Indonesian elements for a bold but sophisticated palette. When you’re using big colors, it pays to plan. “We spent a full week on paint color,” Hillman admits. She and the homeowners landed on two analogous Sherwin-Williams hues: Reynard and Torchlight — both of which are intense, but also warm enough for first-floor functions: eating and entertaining. In the open-concept kitchen and dining space, sleek and modern additions – Slamp plastic and Swarovski crystal pendants, for example – are balanced with traditional finishes and a few antiques: a wood-top dining table and high-backs nestled below an heirloom chandelier. Meanwhile staggered Décor custom taupe cabinets supply rhythm and visual depth matching in vigor white granite countertops and the variegated engineered birch flooring. Eye-catching aesthetic starts at the feet, and it doesn’t stop until it hits the chocolate brown ceilings. 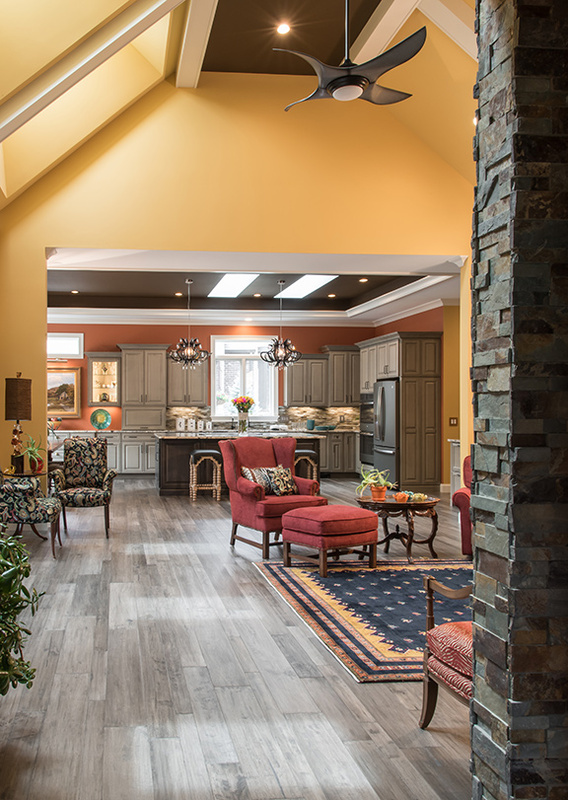 Don’t be fooled: “A dark ceiling looks easy, but it’s more involved than you’d think,” Hillman says, noting that homeowners interested in trying the look should budget in extra time and cash for a level 5 drywall finish plus three coats of paint. The ceiling color continues into the living room, where white box beams add definition and an impactful slate wall steals the show along with the breath of most guests! 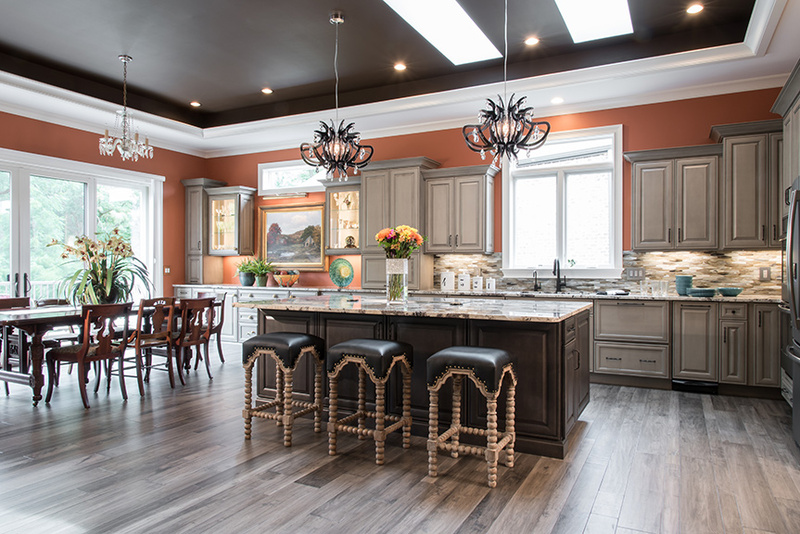 The devil’s also in the details: Recessed orange nooks add a subtle burst of color; back in the kitchen, diamond grout makes the backsplash sparkle, and glass outlet covers – scored at Susan Goldstick Decorative Hardware and Home Décor – add extra oomph. The living room still manages to feel homey, despite its size. Hillman credits colorful accents: yellow walls, of course, along with blue carpeting, burnt-orange zebra print chairs (all fabrics were sourced through Nan Ruvel Interior Design) and a funky blown-glass lamp with an orange shade; there are even specks on green in black patterned wingbacks and floor plants. Upstairs, the master bathroom pays peaceful homage to utilitarian colors, but in a playful way. 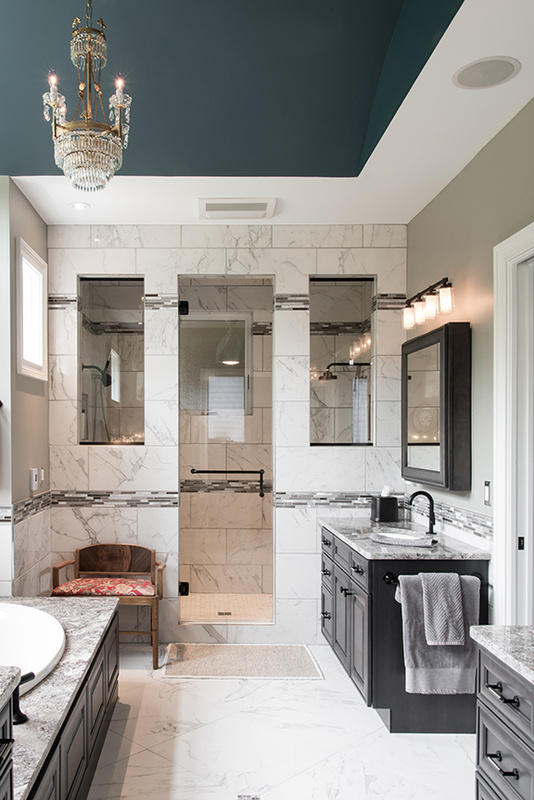 Warm gray walls, Pergaminho granite and white porcelain tile are the base for dark cabinets, a red vanity chair and a teal barrel vaulted ceiling. The lavatory sparkles, too, with stainless-steel outlet covers, diamond grout and crystal lighting. Take a look at that pocket door! Like other custom doors located throughout the home, it was hand-painted by artist Kelly Evans, who did a special mural in a bedroom designated for the homeowners’ grandchildren. A darling – and daring – space theme begins up top, where planets are laid out among a missile-shaped fan and shimmering, dangling stars from Metro Lighting. 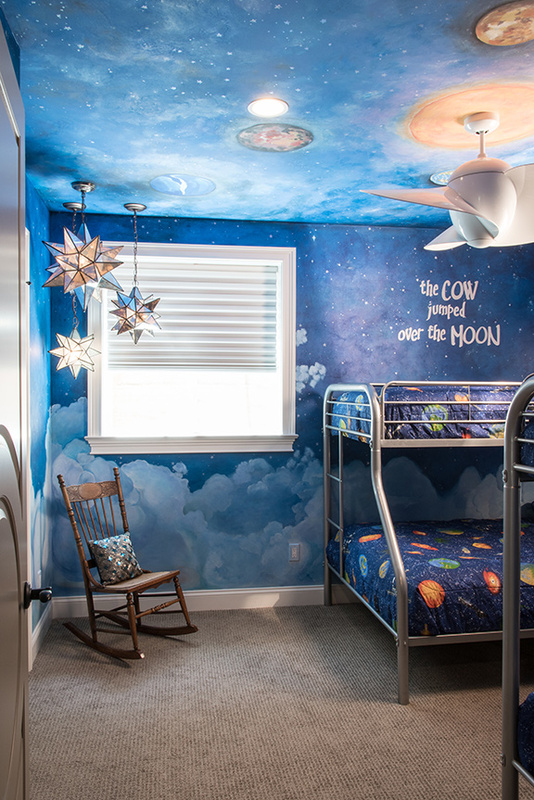 Color eases into clouds as the eye comes down to earth, where you’ll notice dual sets of tubular steel bunk beds. “The picture,” Hillman says, “doesn’t do the room justice.” There’s a lot going on, but it works because it’s done right — and that’s a theme Hillman carried throughout this fabulous villa.